Stranded by the State, a web series in collaboration with In These Times and directed, edited and produced by Liz Kaar broadcast across Illinois as a two-part special presented by Illinois Public Media. The series focuses on the long-term toll that the Illinois budget crisis has had on everyday people across the state, and will begin broadcasting on public television states February 14–the day before Governor Bruce Rauner's state budget address. Illinois has not passed a budget in over a year, and this historic stalemate has proven to be the longest period that any state in the nation has operated without a budget since the Great Depression. "There's been plenty of coverage of the politics behind the budget stalemate in Springfield, but not enough on the impact to families and communities,” said Maurice “Moss” Bresnahan, CEO of Illinois Public Media. 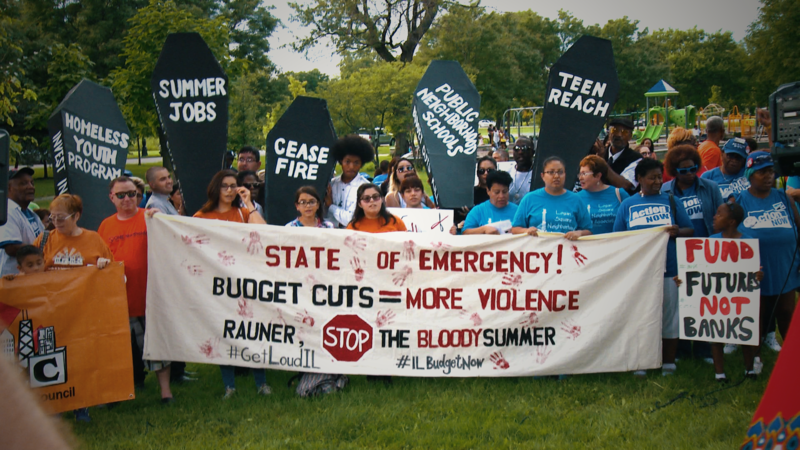 “As Illinois starts its twentieth month without a full budget, this special reveals what the crisis means for ordinary citizens all around the state." Broadcast in two 30-minute parts, the documentary focuses on six different aspects of the crisis: higher education, at-risk youth, homelessness, seniors, adult literacy and early childhood development. The documentary explores how the situation in Illinois connects to long-term trends of austerity affecting the country at large, and demonstrates how such measures can ultimately cost taxpayers more in the long run. Find out more at http://www.strandedbythestate.com, follow the series on Twitter at @StrandedbyState and join the conversation with hashtag #StrandedIL.